European open frame transformer. 150 watt. Plate & filament transformer. 120 volt primary input, two secondary outputs one 5 volt at 3 amps and one 100 volt center tapped (50 volt x 2) at 100 milliamps. 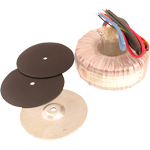 Better Coil & Transformer Co. open frame transformer. Dual 115 vac primaries, Black / Black, Brown / Brown. Center tapped secondary: Red / Green, Orange center tap. 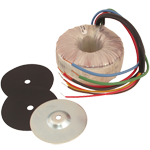 Signal Transformer split bobbin / high isolation PC mount transformer. 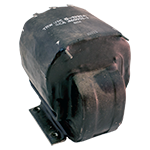 SNC transformer, hermetically sealed. Primary: black wires. Secondary: green wires. Harris P/N: 472-0643-000. Harris transformer. Harris P/N: 472-1023-000. Harris power transformer. Harris P/N: 472-0587-000. 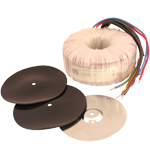 Electronic Transformers Corp. was made for Mackay Marine. Sealed, heavy duty construction. 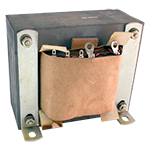 Control transformer has a 40va rating. Mounting configuration: foot, plate, knockout, wire length 9". 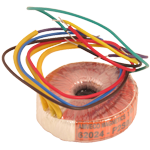 Electro-Line transformer. Epoxy coated. Mounts with four #10 bottom holes. Weighs 2.5 pounds. 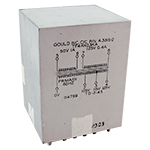 Primary terminals 1 and 2, 115V AC 50/60 Hz also Primary terminals 3 and 4, 115V AC; Secondary terminals 5, 6, 7, 8, and 9 supply 6.5V, 16V, 26V, or 33V per tap @ 1.8 amps. 2nd Secondary at terminals 10, 11 (c.t. 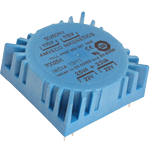 ), and 12 supply 126V (or 63V) at 60 milliamps. NSN: 5950-01-061-7495. Lambda power transformer. Electrostatically shielded. Mounts horizontally with bell and wires on top. Studs on bottom. NSN: 5950-00-050-5240. Freed transformer. Electrostatically shielded. Freed # 4381. 120V 60Hz primary (black, white/black) to two secondaries, one 14V @ 500 milliamp (white, green pair) and one 41.6V center tapped (white, red pair with white/yellow c.t.) @ 500 milliamps. NSN: 5950-00-855-8357. American Magnetics center tapped transformer. 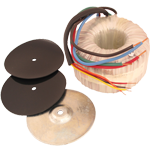 Copper electrostatic shield. P/N: 24-AM-4041. 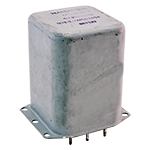 Sola constant voltage transformer. Solid as a brick. Includes capacitor. New. General Electric transformer. Sealed. Mounts top or bottom by four 10-32 taps. Burton transformer. 1 phase, 60 Hz, 200 va, 55º rise. 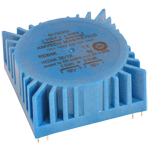 Sola constant voltage transformer. Mounts horizontal on chassis with terminals out bottom. Includes capacitor. New in box. Date code = 1961!! Quality Transformer (Chicago) power transformer. 115v primary (Black/Black), 6.6 ohms. 165 vac secondary (Brown/Red), 500ma, 34 ohms. Electrostatic shield (Green/Green). N.O.S. U.S. made in the 1970's. 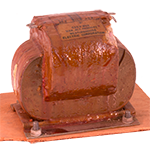 Magnetran Broadcast transmitter salvage. Has lots of life left. 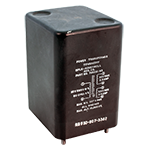 Use an auto transformer by applying a higher voltage to the outside tap to ground and pull off any lower voltage on the rail to ground. 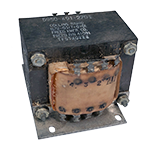 Transformer removed from 20kw RCA transmitter. 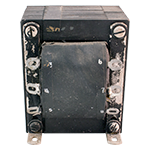 Micron Industries step-down transformer. 1 phase, 3 kVA. MIL-T-16315. NSN: 5950-01-166-1789. Two 117v 50/60Hz International Primaries; Two secondaries 30v, 7.7amp, 460VA. 5.4"DIA x 2.6"H 7.9lbs. UL & CSA recognized/certified. 10" Color coded leads. Class A 105°C. Two 117v 50/60Hz International Primaries; Two secondaries 30v, 10.4amp, 625VA. 5.5"DIA x 3.2"H 9.5lbs. UL & CSA recognized/certified. 10" Color coded leads. Class A 105°C. Two 117v 50/60Hz International Primaries; Two secondaries 55v, 9amp, 990VA. 6.5"DIA x 3"H 15.2lbs. UL & CSA recognized/certified. 10" Color coded leads. Class A 105°C. 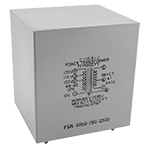 Quad 100/120/220/240v 50/60Hz primaries; One secondary 110v, 1.92 amp, 230VA. 4.6"DIA x 2.4"H 5.2lbs. Multiple primaries must be connected in series or parallel. 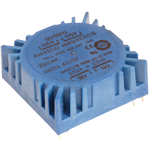 Quad 100/120/220/240v 50/60Hz Primaries; Two secondaries 110v, 5amp (240v, 2.5amp), 600VA. 6.2"DIA x 3.1"H 13lbs. Multiple primaries must be connected in series or parallel. 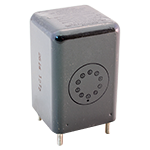 Quad 100/120/220/240v 50/60Hz Primaries; Two secondaries 110v, 8.33amp (220v, 4.16amp), 1000VA. 6.9"DIA x 3.5"H 20lbs. Multiple primaries must be connected in series or parallel. Factory new production overrun stock. 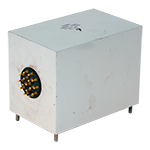 Quad 100/120/220/240v 50/60Hz Primaries; Two secondaries 110v, 25amp (240v, 12.5amp), 3000VA. 10"DIA x 4.3"H 47lbs. Multiple primaries must be connected in series or parallel. 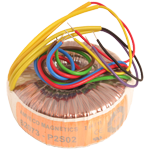 Quality Transformer power transformer. Electrostatically shielded. 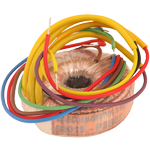 Primary 120 volt, 8 ohm to secondary 170 volt at 500ma, 48 ohm DCR. 85VA. Dimensions: 3" x 2-5/8" x 2-1/2" high. Made in the U.S. Circa 1970's. 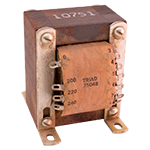 Signal Transformer Co. single phase transformer. 50 Hz min, 500 Hz max, single phase input / output. 6 pin. New, old stock. 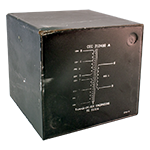 Electronic Measurements transformer. 115v @ 47-800 Hz primary input. Two secondary outputs: 192v AC @ 2 amps & 155v AC @ 0.15 amps. 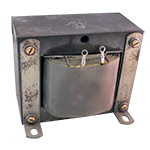 4.25" x 6" x 4.2"H.
Freed transformer. Hermetically sealed. Turret terminals on bottom. 1-3/16" mounting stud centers. Navy transformer. Hermetically sealed. Primary: 117v AC # 1 & 2 no load, 3 & 4: 40v, 3 & 5: 60v, 4 & 5: 20v. Secondary: 60v @ 100mA. 60v @ 0.1 amp tapped 20v / 40v. Date: 1950's. UTC transformer. Primary: 3 & 7: 115v AC. Secondaries: 4,5,6: 45v c.t. @ 0.3 amps, 1,2: 4.5v @ 1 amp. Sealed. 4.4 lbs. 3-7/8" x 3" x 4". 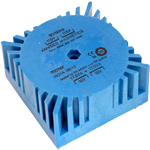 Dimensions: 5-1/4" x 4-1/16" x 3-5/8"
Transformer. Primary: 115v AC. Secondaries: 160v AC @ 2.5 amps, 32.6v c.t. @ 2 amp. 14 lbs. 5-1/4" x 4-1/16" x 3-5/8". Magnetika transformer. Primary: 115v @ 60 Hz. Secondaries: 46.2v RMS c.t. @ 2.5 amp, 22.4v RMS c.t. @ 2.5 amp. 8.9 lbs. 4-1/4" x 4" x 3-5/8". 2-3/4" x 3-1/4" mounting centers. Triad transformer. Primary: 200/220/240v AC. Secondary 1: 3,4,5: 48v c.t. @ 1 amp. Secondary 2: 6,7,8: 16v c.t. @ 1.25 amp, 60vA. 3 lbs. 2-1/2" x 2-3/4" x 3-1/8". Some rust on lamination surfaces. 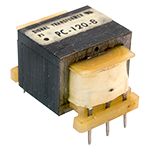 KTC open frame transformer. Primary: 115v AC (blk-blk). Secondaries: 30v @ 1 amp (org-org), 16v c.t. 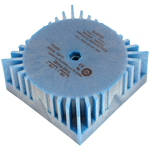 @ 2 amp (blu-wht-blu), 30v c.t. @ 2 amp (brn-yel-brn). 6 lbs. 3-1/4" x 3-1/2" x 4-1/4". 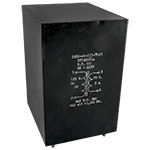 Dimensions: 6" x 4-3/4" x 5-1/2"
Transformer Engineers transformer. Primary: 115/120/230/240v. Secondary: 34v @ 16 amp. Hermetically sealed. Side terminals. 6" x 4-3/4" x 5-1/2". 3-1/4" x 4-3/4" mounting centers on bottom tapped #10. 22.9 lbs. Some dents and scratches. 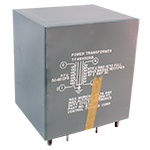 Dimensions: 5-1/4" x 4" x 4-1/2"
Power Transformer. Primary: 115v AC. Secondaries: 32v c.t. @ 1.5 amp, 160v @ 2 amp. 5-1/4" x 4" x 4-1/2". Gould transformer. Primary: 105/115/125v @ 60 Hz. Secondaries: 50v @ 1a, 125v @ 0.4a. Hermetically sealed. Turret terminals. 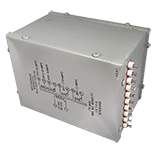 3-7/8" x 3-1/4" x 5-1/8"H.
Control-Tronics transformer. Primary: 115v @ 50-60 Hz. Secondary: 97.5v RMS into full wave bridge @ 2a DC. Hermetically sealed. 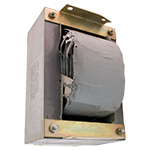 4-1/4" x 5" x 5-1/2"H.
Power Transformer. Primary: 115v @ 60 Hz. Secondary: 78v @ 3 amp. 350wv. Hermetically sealed. 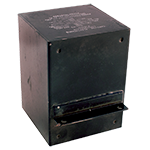 3-1/2" x 4-1/4" x 5-1/2"H.
Freed transformer. Primary: 117v @ 50-400 Hz. Dual secondary: 200v RMS @ 60mA, 18v c.t. @ 1 amp. Hermetically sealed. Turret terminals. 2-5/8" x 2-3/4" x 3-5/8"H. 2" x 3-1/4" mounting centers on side flanges. Triad transformer. Primary: 125/115/105v @ 48-62 Hz. Secondary: 48v c.t. @ 3 amps, 535wv. Electrostatically shielded. Hermetically sealed. 3-9/16" x 3-1/4" x 3-3/4". Coast Coil power transformer. Hermetically sealed. 115v AC @ 50 - 440 Hz primary. 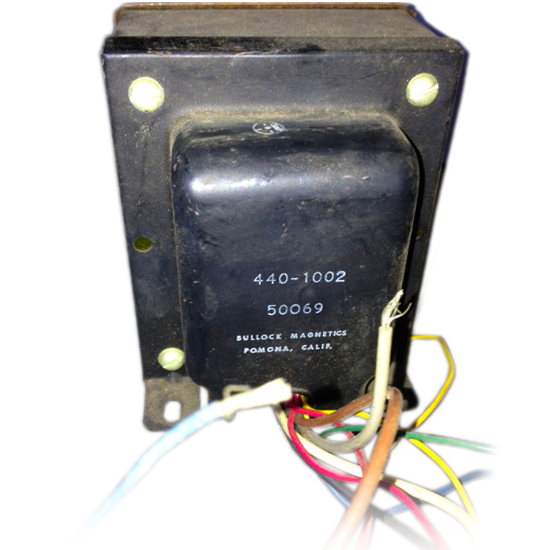 Honeywell power transformer. Hermetically sealed, round corners. Electrostatically shielded. Turret terminals. 2-1/8" x 2-5/8" mounting centers on 10-32 studs. 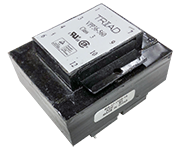 Triad PC mount transformer. 36 vct @ 0.56 amp, 18v @ 1.12 amp. 4kv test. 50/60 Hz. 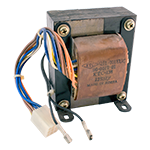 PC Mount Transformer 10VA, 36 vct @ 0.28 amp, 18v @ 0.56 amp. 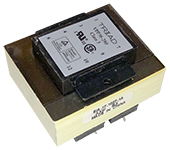 Triad PC mount transformer. 36 vct @ 0.28 amp, 18v @ 0.56 amp. 10 va. 4 kv test. Westinghouse power transformer. 3 windings. Four 1/4-20 mounting studs. Ceramic / turret side terminals. Freed Collins transformer. 50 watt core. 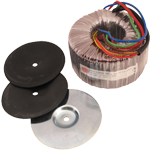 2 secondary windings: 75v c.t. & 130v AC. 110/220.